Are you looking for wooden shoe racks to keep your shoes well organized at home or in office? 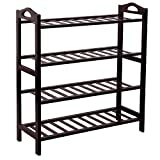 If so, let me introduce you to the top ideal wooden shoe racks and shoe storages for your consideration. These wooden shoe racks are built environmental friendly and allow you to manage and store your shoes properly. Having one of them will make your home look neat. Let’s have a look at the list of the wooden shoe racks and shoe storages below. When it comes to the top-class wooden shoe racks, no other shoe rack can beat Seville Classics 3-Tier bench. The shelf has three tiers where you can easily keep up to 9 pairs of shoes. In each tier, you can store up to 30 lbs weight. Each shelf of this wooden shoe rack is wide enough and high enough to hold minimum 3 pairs of shoes. If your shoes are small in size, you can even keep 4 pairs in a single shelf. It also comes with the screw-in leveling feet, so you can drag it anywhere. The brown finish in the supporting iron rods gives an elegant look to the rack. If quality means more than looks to you, this wooden shoe rack is absolutely for you. Comparing it with the first shoe rack, it is different in design as well as looks. Made of pure and robust bamboo wood, Songmics Shoe bench is actually a 2-tier rack but you can keep the stuff even on the top of the rack. The only difference here is that the top tier doesn’t have the side-support. So, the items can fall down sometimes. However, with round corners and firm supporting legs, Songmics shoe bench ensures a long durability. 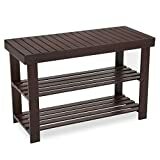 If you want bamboo shoe racks but can’t store all your shoes in Songmics 2-Tier shoe bench, get BirdRock Home 3-tier one. The bench has 3 tiers, so it makes enough space to store at least 10-12 pairs of shoes depending on the size. This shoe rack doesn’t have the padded leg caps, so you can’t drag it around. To move it around, you have to lift it up manually. Maybe that’s why the rack is built extremely lightweight. It weighs only 5 pounds. 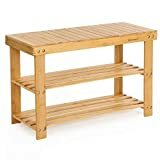 Another bamboo shoe rack in this list but this one is not only a shoe rack rather a multifunctional self. If you’re looking for a rack for your own use only, this one would be the best for you. You can store up to 6 pairs of shoes in both shelves of the rack. Apart from the shoes, you can also keep bags and other such small belongings in the top shelf of the rack. It is like BirdRock 3-tier rack in design as well as quality and functions the same way too. First 4-tier wooden shoe rack in our list! If you want a commodious shoe rack in incredibly decent price, Furinno FNCJ-33005 shoe rack should be at the top in your list. Made of solid pine wood, Furinno FNCJ-33005 has 4 shelves which make enough space to fit at least 12-14 pairs of shoes. The rack has 4 supporting legs but the shelves don’t have the side support. So, small shoes might slide off the shelves. Though it is big in size, it is extremely easy to put together. If you want a multi-functional rack in the name of a shoe rack, ClosetMaid 8983 shoe rack is made for you. It is completely different in design as compared to all other shoe racks. It is more of a closet. There are 15 cubes in the rack where you can keep your every pair of shoe separately. The best thing about this shoe rack is that you can even store your regular clothes and small belongings. They can never slide down. Probably, the cheapest and the most portable shoe rack in this list! If you have only a few pairs of shoes, this one would meet all your demands perfectly. It has two tiers but the top shelf doesn’t have the side support. You can keep the shoes on bottom shelf and on upper shelf, you can also keep other belongings. Made of natural wood, Whitmor Wood Household shelf is a perfect fit if your room doesn’t have much space because it is small in size. If the all above-mentioned wooden shoe racks don’t fulfill your demands of organizing all your shoes, get Songmics’ 4-tier shoe rack. It has 4 wide, lengthy, and high shelves that can hold up to 15 pairs of shoes. It is made of pure bamboo wood but is furnished in a way that it seems to be an iron rack. There are two handles, with the help of that you can easily move it around. 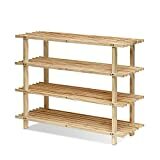 Songmics 100% bamboo 4-tier shoe rack is an ideal fit for an extended family. If you want shoe rack that can even accentuate the elegance of your living room, get Songmics Entryway Bamboo 2-Tier shoe rack. It is the most stylish shoe rack in this list. Made of pure bamboo, the rack has a dusky brown finish all through. The joints and the corners are fixed with the double screws which add an extra durability to the rack. The rack has two shelves and one top roof. Means, it’s kind of a 3-tier rack. At the top of the rack, you can keep any small item. Again, a totally different shoe rack in this list! In fact, it doesn’t look like a shoe rack either. From your clothes to your accessories and from your gadgets to your shoes, you can store anything in ClosetMaid 8923 stackable shoe rack. The best thing about this rack is that it is made of laminated wood that gives it a sleek look. It has two shelves aside from the top roof of the rack. I hope you find your favorite one out of these top 10 best wooden shoe racks. Get the one and store all your unnumbered pairs of shoes in one place.